The Chas Brownlow Trophy, more commonly referred to as the Brownlow medal, is the most prestigious individual award in the AFL industry. The Brownlow, or ‘Charlie’ as it is affectionately known, is awarded to the best and fairest player in the league, based on a 3-2-1 voting system allocated by the officiating umpires of each match. The ‘fairest’ part of the medal has been a constant source of controversy. There have been two instances in the award’s history (North Melbourne’s Corey McKernan in 1996 and the Western Bulldogs’ Chris Grant in 1998) where the player who has polled the most votes has been ruled ineligible due to suspension. The Brownlow medal is awarded on the Monday night before the AFL Grand Final, with the votes being read out round-by-round by the CEO of the AFL. It goes without saying that if you think you are on a good thing in sport, not just Brownlow betting, getting in early is imperative if you want to get the good odds. However, if you are taking the early odds on players the threats of injury and suspension are always an issue. In 2015, Fremantle superstar Nat Fyfe’s dominant early start to the year had him earmarked as the early favourite to take home the Charlie, with his pre-season odds of $7 halved to $3.50 just five rounds into the season. The possibility of transgressing the ‘fairest’ element of the award is a constant threat, but the AFL’s changes to the tribunal system are supposed to protect players from having their medal chances stripped away for innocuous events. Things did not quite work out that way in 2017, however, when Richmond’s Dustin Martin was left as the overwhelming favourite after both Patrick Dangerfield and Zach Merrett – two of the season’s standout midfielders – were suspended late in the year. The Brownlow Medal is awarded to the player in the AFL that collates the most votes from round one through to round 23. This typically means if a player can play consistent football throughout the majority of the AFL season in a team that has on-field success, he will invariably poll a significant chunk of votes by the end of the season. However, a team that has multiple stars will have players taking votes off each other. It is simply a by-product of team success. The teams that are heavily reliant on an individual player’s brilliance usually do not march deep into September, but have players up towards the top of the leaderboard come Brownlow night. As a point of reference: from 2003 all the way through to 2014, only twice has a player won the Brownlow and won the premiership in the same year. 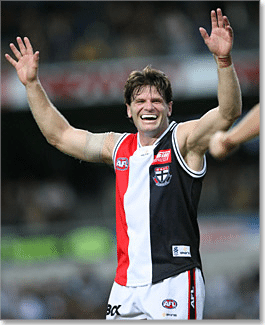 It is often argued by footballing purists that it is the hulking forwards who kick goals that win you matches, or the stout defences that can restrict the flow of scoring are the most important components of a premiership side, but throughout history it has been proven time and time again that the Brownlow is the midfielder medal. In the period between 1976 and 2014, there have been very few non-midfielders take home the Brownlow. A couple of notable exceptions include the AFL’s all-time leading goal kicker Tony Lockett (1987) and a young back pocket from Essendon called Gavin Wanganeen (1993). Every year betting trends will lean towards a dominant forward who has played a large role in their team’s surge up the ladder, but beware: invariably anything under a six-goal game from a spearhead is not enough to earn the umpire’s votes. Lance Franklin entered the Brownlow count as one of the big favourites in 2008 after being the first player in almost 20 years to kick 100 goals in the home and away season, but this was only enough to elevate the former Hawk to sixth on the board. It is a long-held view that modern football is too stats heavy and that numbers do not tell the entire story, but this is not exactly the case in Brownlow Medal betting. While great emphasis is placed upon players that have a profound impact on the game, sheer weight of numbers usually plays well with the umpires as those with the ball in hand most often are in constant view of the vote givers. In the period between 2007 and 2014, only once has the Brownlow Medal winner averaged outside the top 10 in the league for total disposals, while the man who has finished top two on that list has taken home the award on four separate occasions. Ball magnets can sometimes be your best bet, so keep an eye on the overall stats sheet at the completion of the season and make sure you put the amassed kicks and handballs into your Brownlow betting calculations. Brownlow betting like no other has the sort of fluctuations that we see only in horse racing. Invariably you will get someone professing to have ‘insider information’ on the day of the count, or a Brownlow vote tracker that professes to have the formula that mimics the way the umpires vote. Do not be fooled by these. Typically there is a plunge on a certain player that sways the ‘floating’ punter, but if you are going to bet on the Brownlow, you need to trust your own judgement and stick to your guns. All Australian bookies worth their salt run Brownlow Medal odds year-round. Those outright offerings become more diverse as the night of the count approaches and the market makers delve into club-by-club betting, group options, match bets and a number of exotic markets.